This project lets you conveniently connect any computer with USB ports directly to a simple, traditional connector the 9-pin RS-232,It converts the electrical signals from a USB<–>serial TLL convertor to the RS-232 standard. So in a nutshell,it converts a USB port into a standard but basic serial port. 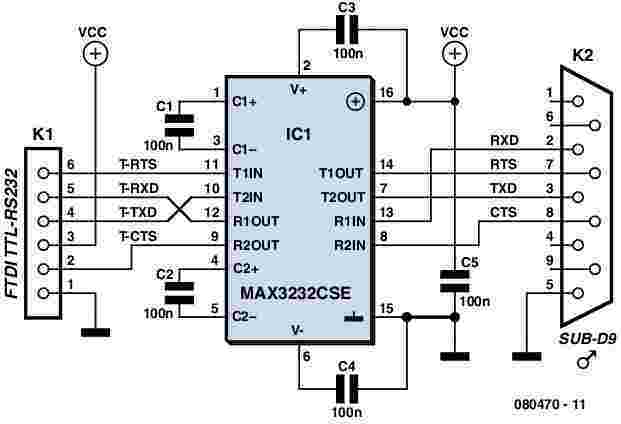 The voltage level adaptor is a MAX3232 from Maxim. 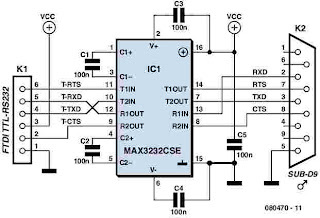 This industry-standard part comprises two transmitters and two receivers, ideal for our USB<–>serial convertor, which itself offers the four fundamental signals of an RS-232 standard port, namely TXD (Transmit Data), RTS (Request To Send), RXD (Receive Data) and DTR (Data Terminal Ready).